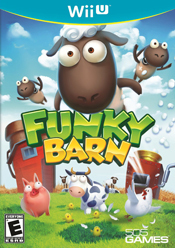 Design, create and customize your farm, fill it with adorable animals and crazy machines and discover the delights of Funky Barn. Personalize your game by naming each of your animals and giving them a distinctive look; and be sure to visit the petting patch for rewarding close-up cuddles. When you are experienced enough, you can even choose to care for exotic animals like the Alpaca and Buffalo. You will be kept busy in all four seasons as you grow your farm; carrying eggs, shearing sheep, milking cows, shaking fruit from trees and packing it, building fences and roads, planting crops while planning for your new arrivals. Keep foxes away with your own trusty dog or even protect your cows from alien abductions with your own air force. Three difficulty levels allow everyone in the family to enjoy the farming lifestyle; and no two farms are ever the same. Whether you go for the laid-back, organic style of farming, or the high-paced, high-tech wizardry of a fully automated farm, you’ll always find the right style for you. So come on down and get funky; it’s farmin’ time! Create and Play – Your way! Purchase hilariously offbeat farm equipment and cultivate a vibrant paradise as you get hands on with the farm you want to create! Ready to make some wool? Pop your sheep into The Shearing Machine and it will comically cannonball out... surprised but shorn. Ready to harvest your crops? Hook up the Flying FruitBox-Haybale-Copter that flies around crazily picking up boxes of fruit and grain. Strategies for success! Spend your money wisely, nurture your animals and trade with neighbours. Use the gamepad in all new ways! Touch, tilt, shake, speak to control your farm. Get hands-on with your animals! From a tiny chick to a giant buffalo, gently stroke the feathers or fur in the petting patch, then watch the delighted responses. © 2013 Tantalus Media Pty Ltd. All rights reserved.